I remember the first time I ever had Butter Chicken was actually in San Francisco! I had never tasted anything like it before, and very quickly I decided that I needed to give Indian food some serious trying. I love making Butter Chicken because it is different and my version is so quick and simple. It is nice and saucy which is perfect for dipping naan bread or covering a bed of rice. - Heat oil in fry pan. Fry onions and chicken on medium high until chicken is no longer pink. - Add tomatoes, Club House Butter Chicken seasoning, and milk. - Simmer on medium for 10 minutes. - Place in casserole, and warm prior to serving. 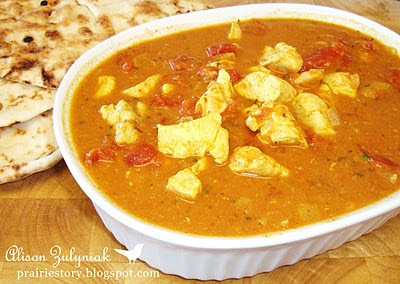 - Serve with naan bread and rice. This looks great! I"m sad we don't have those spices down here. I looked at their web site and they have so many varieties. They even have salt and vinegar popcorn seasoning! YUM! Wow does that look amazing. I cannot wait to try it.